The wild poppy is a prime example of the horticultural definition of a wild flower--it can grow without any cultivation in a natural setting. California's native flower is the poppy, and there are several areas where you can drive by fields filled with poppy flowers almost as far as the eye can see during the spring. All of the cultivars can be coaxed into growing within a garden, provided a few basic requirements are met. All you need are the poppy seeds. 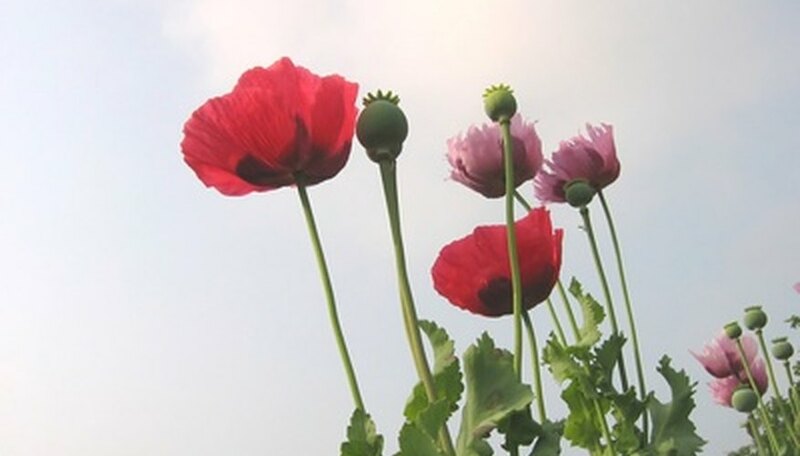 Collect your seeds just after they mature in the seedheads of the poppy plant. They do not store well, so separate them from the other plant matter and store them in a cool and dry area in an container, such as a paper envelope, until you are ready to use them. If you buy a packet of seeds, make sure it is marked for growing in the current season. Sprinkle the seeds in the area where you want to grow the poppies. Since they need to go through a period of stratification to break their dormancy, plant them in the fall so they can naturally go through the cooler winter months and then germinate in the spring. Poppies will naturally self-sow and germinate, so there is no need to give them special care at this stage. Thin the plants in the spring so that you have just one plant per every square foot, or they will crowd each other out. Sometimes you can successfully transplant poppies, but if you damage the tap root, the plant tends to suffer and wilt, and sometimes die. Remove any weeds that spring up around the plants and keep dead blossoms trimmed to keep the poppy in full bloom for a little longer.